O’Neal Manufacturing Services (OMS) has installed its second Arku FlatMaster leveler, a model 120-200, at its headquarters plant in Birmingham, AL. Reportedly the largest FlatMaster leveler in North America, the machine can level parts from steel as thick as 1.675 in. and to 78 in. wide. The contract for the Birmingham plant largely involves mild steel nearly 1 in. thick, with a minimum yield of 36 to 50 ksi. The parts are laser- or plasma-cut from plate and vary widely in size and shape, some with openings. A typical flatness requirement is 0.07 in. across a 60-in. dia. The FlatMaster allows users to adapt the leveling force to varying shapes. 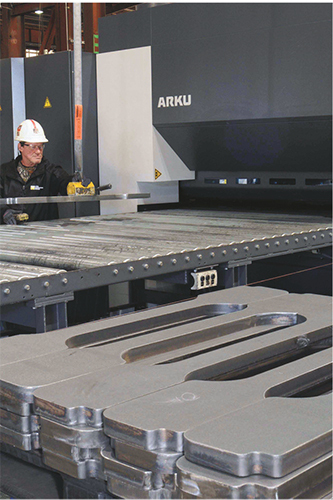 Each part presents a changing cross-section as the leading edge, center and trailing edge enter the leveling rollers. These changing cross-sections require varying levels of force to maintain the leveling gap. The FlatMaster’s servo-hydraulic system can quickly recognize any change in the required force and adjust to maintain a precise gap.